Not to be confused with Water slide. A Water Coaster is a roller coaster that combine roller coaster elements, such as chain lift hills and steep drops, with boat-based attraction elements, such as splash-down landings. The boat is pulled up on the tracks and then start a trip. The finale of the water coaster contains of a steep drop that ends in a wave. This roller coaster is characterised by gentle layout with drops and splash. Some water coasters turn into log flume style trains once they hit the water, with the traditional coaster rails ending leaving the train floating in a trough. Other types of water coasters have fixed rails all the way around the coaster. ^ Marden, Duane. "Unknown (Victory Kingdom Guillin)". Roller Coaster DataBase. Retrieved June 12, 2012. ^ Marden, Duane. "Across Amazon (Victory Kingdom Tianjin)". Roller Coaster DataBase. Retrieved June 12, 2012. ^ Marden, Duane. "Adventure Coaster (Odakyu Mukogaoka Yuen)". Roller Coaster DataBase. Retrieved June 12, 2012. ^ Mack Rides. "The SuperSplash". Mack Rides. Retrieved March 16, 2019. ^ Rasquin, Dirk. "Aktium (Cinecittà World)". European Water Ride DataBase. Retrieved March 16, 2019. ^ Marden, Duane. "Atlantica SuperSplash (Europa Park)". Roller Coaster DataBase. Retrieved June 12, 2012. ^ Marden, Duane. "Big Timber Log Ride (Enchanted Forest)". Roller Coaster DataBase. Retrieved June 12, 2012. ^ Marden, Duane. "Blue Water (Happy Magic Mountain)". Roller Coaster DataBase. Retrieved June 12, 2012. ^ Marden, Duane. "Buzz Saw Falls (Silver Dollar City)". Roller Coaster DataBase. Retrieved June 12, 2012. ^ Marden, Duane. "Caribbean Splash (Formosan Aboriginal Culture Village)". Roller Coaster DataBase. Retrieved June 12, 2012. ^ Marden, Duane. "Dive to Atlantis (Mt. Olympus Water & Theme Park)". Roller Coaster DataBase. Retrieved June 12, 2012. ^ Marden, Duane. "Divertical (Mirabilandia)". Roller Coaster DataBase. Retrieved June 12, 2012. ^ Marden, Duane. "Escape From Amazon (Dream Land)". Roller Coaster DataBase. Retrieved June 12, 2012. ^ Marden, Duane. "Flume Ride (E-DA Theme Park)". Roller Coaster DataBase. Retrieved June 12, 2012. ^ Marden, Duane. "Hydro Racer (Xishuangbanna Theme Park)". Roller Coaster DataBase. Retrieved June 12, 2012. ^ Marden, Duane. 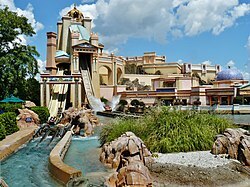 "Journey to Atlantis (SeaWorld Orlando)". Roller Coaster DataBase. Retrieved June 12, 2012. ^ Marden, Duane. "Journey to Atlantis (SeaWorld San Diego)". Roller Coaster DataBase. Retrieved June 12, 2012. ^ Marden, Duane. "Journey to Atlantis (SeaWorld San Antonio)". Roller Coaster DataBase. Retrieved June 12, 2012. ^ Marden, Duane. "Journey to the Falls (Splendid World Fantasy Land)". Roller Coaster DataBase. Retrieved June 12, 2012. ^ Marden, Duane. "Jurassic River (Cavallino Matto)". Roller Coaster DataBase. Retrieved June 12, 2012. ^ Marden, Duane. "Kersplash (Edaville Family Theme Park)". Roller Coaster DataBase. Retrieved June 12, 2012. ^ Marden, Duane. "Kersplash (Washington State Fair)". Roller Coaster DataBase. Retrieved June 12, 2012. ^ Marden, Duane. "Kraken's Revenge (Desaru Coast Adventure Waterpark)". Roller Coaster DataBase. Retrieved June 12, 2012. ^ Marden, Duane. "Montanha Russa (Aquashow Family Park)". Roller Coaster DataBase. Retrieved June 12, 2012. ^ Marden, Duane. "Overwater Roller Coaster (Floraland Continent Park)". Roller Coaster DataBase. Retrieved June 12, 2012. ^ Marden, Duane. "Polar Explorer (Chimelong Ocean Kingdom)". Roller Coaster DataBase. Retrieved June 12, 2012. ^ Marden, Duane. "Poseidon (Europa Park)". Roller Coaster DataBase. Retrieved June 12, 2012. ^ Marden, Duane. "Skatteøen (Djurs sommerland)". Roller Coaster DataBase. Retrieved June 12, 2012. ^ Marden, Duane. "Speed (Energylandia)". Roller Coaster DataBase. Retrieved June 12, 2012. ^ Marden, Duane. "Storm Coaster (Sea World)". Roller Coaster DataBase. Retrieved June 12, 2012. ^ Marden, Duane. "SuperSplash (Plopsaland De Panne)". Roller Coaster DataBase. Retrieved February 5, 2010. ^ Marden, Duane. "SuperSplash (TusenFryd)". Roller Coaster DataBase. Retrieved June 12, 2012. ^ Marden, Duane. "Surfing Boat (Jinling Happy World)". Roller Coaster DataBase. Retrieved June 12, 2012. ^ Marden, Duane. "Tiger Leaping Gorge (Colourful Yunnan Paradise)". Roller Coaster DataBase. Retrieved June 12, 2012. ^ Marden, Duane. "Typhoon Coaster (Land of Legends Theme Park)". Roller Coaster DataBase. Retrieved June 12, 2012. ^ Marden, Duane. "Vliegende Hollander (Efteling)". Roller Coaster DataBase. Retrieved June 12, 2012. ^ Marden, Duane. "Vonkaputous (Linnanmäki)". Roller Coaster DataBase. Retrieved June 12, 2012. ^ Marden, Duane. "Walrus Splash (Chimelong Ocean Kingdom)". Roller Coaster DataBase. Retrieved June 12, 2012. ^ Marden, Duane. "Water Dragon King (Sun Tribe)". Roller Coaster DataBase. Retrieved June 12, 2012. ^ Marden, Duane. "Wild Chase Coaster (Sunway Lagoon)". Roller Coaster DataBase. Retrieved June 12, 2012.